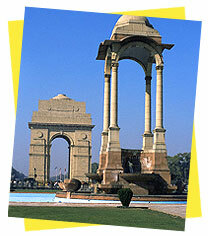 India Gate is one of the magnificent historic structure stands tall in midst of capital city of Delhi. Located on the Rajpath, the gate is huge and impressive, almost 165 feet high and a arch of 138 feet attract tourists all over the world. The entire arch stands on a low base made up of red Bharatpur stone and rises in stages to a huge moulding, beneath, which are inscribed Imperial sons. Amar Jyoti that burns day and night under the arch to pay gratitude to Indian soldiers who thwarted the attempt of Pakistani army during Indo-Pakistan War of December in 1971. India Gate is a wonderful place for picnic as hoards of people hovering around the brightly lit area and laid-back on the lush green lawns in the evening of summer. The entire wide street in front of the Gate is like a carnival in the weekends. 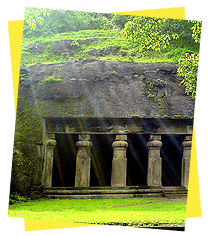 Elephanta Caves is in Elephanta islands , which is located in the neighborhood of rushing metropolitan Mumbai. 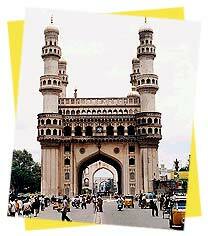 It is a wonderful tourist attraction and recognized by UNESCO as a World Heritage Site. Elephanta Caves was named by Portuguese traveler, after being amazed to see a statue of elephant near the landing of the island. The Elephanta caves are located 10 km away from Mumbai and house a number of elegant sculptured temples cut from rock, way back to the 5th century. These rock cut temples are dedicated to Lord Shiva, the whole of temple complex is huge, about 60000 square feet and consists of three chambers, one is main and other two are laterals. It is said that caves were used as a target practice for the Portuguese and they had constructed a fort and prepare a small army to stave off pirates. 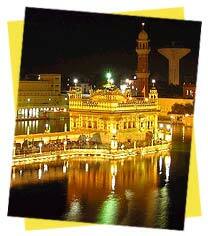 The Golden Temple is the result of Sikh Guru Arjan Dev's envision of a temple reflecting resoluteness, strength and indestructibility of the faith. His majesty had named the temple as Harmandir and wanted it to reflect the clarity, simplicity and logic of the new Sikh movement. The Temple is situated in the midst of a pool symbolizing the synthesis of Nirgun and Sargun: the spiritual and temporal realms of human existence. Rather than drawing attention to its external manifestations Arjan Dev wanted it to show the power of inner faith and self-motivation, by changing the usual architecture of making high temples. He designed it lower than the ground level to signify his motive. 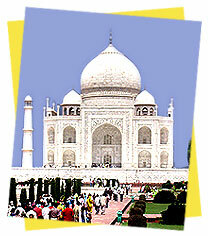 Taj Mahal India, the marble glory of India is synonymous with India. The priceless monument of love was built by Shahjahan, the 5th Mughal Emperor in the memory of his beloved mistress, Mumtaz Mahal. The construction of this most familiar monument of India was completed in the year 1648, after twenty-two laborious years, and the combined effort of over 20 thousand workmen and master craftsmen. Situated on the banks of the river Yamuna in Agra, Uttar Pradesh, Taj Mahal is undoubtedly one of the most spectacular buildings of the world. Built of white Makarana marble, Taj Mahal India is renowned for its architectural splendour and picturesque beauty. Taj Mahal is counted among man's most superb creations and is everlastingly included in the list of the world's champion wonders. 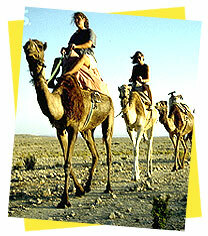 Camel Safari through the Great Indian Desert is the right dose for any adventurer who dare to think beyond veritable ventures. In the vast desolate desert, camel safari is a real test where you are always on the toes to face the extremes that keeps on inflame your grit and determination. You can have an option to choose less rigorous path but true fun is to accept the challenges run in the brutal Thar desert. ‘Ship of the desert’, a well suitable metaphor for the ubiquitous humped –back grotesque animal, which is often eulogized as a lifeline of the desert. Apparently, a camel safari seems a soft adventure but it is tough enough and almost run out your energy at some extreme situations. The world’s seven largest desert is arid and undoubtedly, godforsaken area in Indo-Pacific region, is also known as ‘Great Indian Desert’. 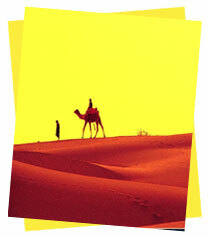 Thar desert is located in western India and south eastern Pakistan. The desert is huge and seems completely crept in desolation. The only river that crosses these sands is the flimsy ‘Luni’ that join Arabian sea through the Rann of Kuch. The land of huge sand dunes, broken rocks and scanty vegetation have an impact of visitors as the desert is somehow very unique from other desert and those who love to roam around and have bellicose spirit to combat with all natural adversities, Thar desert is the right place to move. Region is blank where sun kissing the sand during daytime and night is devilishly cold that excites visitors with every tiny motion. More to travel, more to explore new adventures and eventually an experience of a lifetime.